As a Search Engine Marketer, you know how hard it is to get backlinks to your website. You put so much time and effort into getting new links, but once you have them you just copy and paste the links into a Spreadsheet or Notepad and forget about them. We need an easy way to monitor these backlinks so that we know if the links are still active or not. 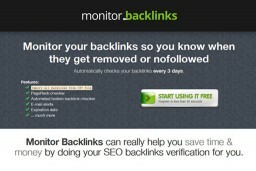 Monitor Backlinks is a new SEO Tool (launched in 2012) that helps you monitor your backlinks. 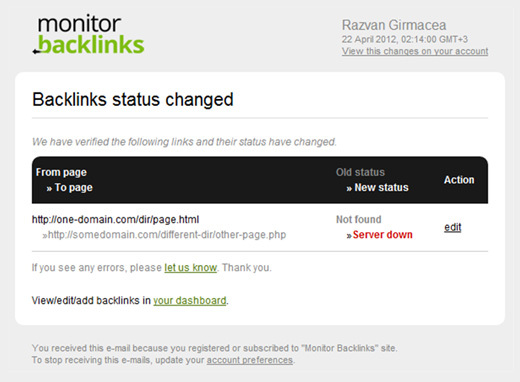 You get automatically notified by email if one of your backlinks becomes inactive. This tool is extremely easy to use and can help you save time and money by doing the link verification for you. All you have to do is add your backlinks, then you get notified if they are changed, removed or if they are going to expire. 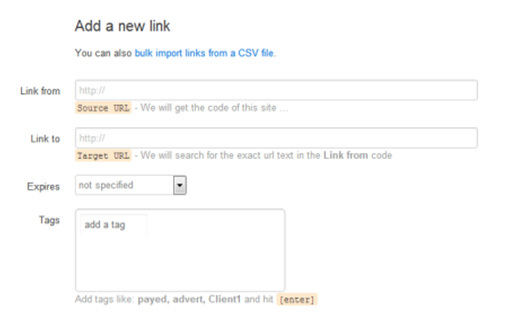 Adding new links is extremely easy, you can manually add them or import them from a file. What’s more, you can group your links by adding tags and notes. As I said before, the dashboard gives you relevant information about your backlinks, like Google PageRank, Alexa Rank, Anchor Text, IP, Nofollow checker, Expiration Data and much more. If one of your backlinks gets changed, removed or if it’s going to expire, you get automatically notified by email the next day. Using the free Backlink Checker you can find new backlinks for your site and you can add them to be automatically monitored by Monitor Backlinks. Using HTTP Status Check Tool you can find out if you have broken links on your website or bad redirects, which will cause you to lose SEO juice. If you register now (takes less than 30 seconds) you get the chance to test the Monitor Backlinks tool for 30 days and monitor up to 500 links. Also, every user can monitor 10 links for an unlimited time for free. Give it a try and let me know what you think. 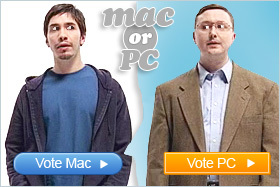 it a very useful tool that always looking for. to be paid is a little bit bad but may be will be worth. 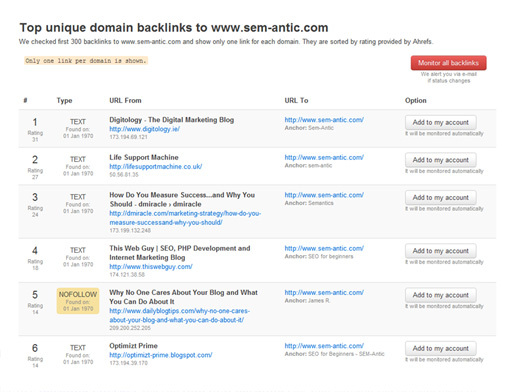 Great Tool to monitor backlinks, if we are building less links each month which are of high quality then this type of tools are really useful.